These Mini Toasts are delicious crispy canapés' bases that can be appreciated for appetizers, soups or snacks. Wheat flour; Yeast; Vegetable fat; Sugar; Yeast; Wheat Gluten; Salt; Antioxidant: ascorbic acid. 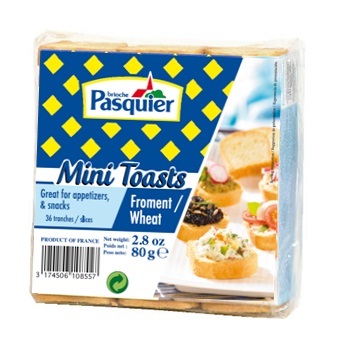 Pasquier Mini Toasts are ideal matches for servings of foie gras, smoked salmon, cheese or many other toppings.